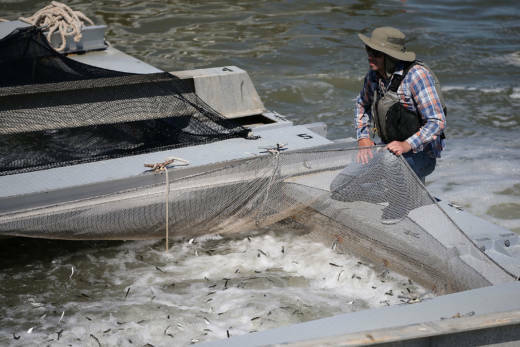 Federal fisheries officials said Tuesday they will consider putting the Klamath River's once-flourishing wild spring-run chinook salmon on the list of threatened or endangered species. The National Marine Fisheries Services plans a 12-month review on whether to give protected status to the salmon in and around the Klamath River. Spring chinook, historically the first chinook salmon to return from the ocean each winter, were once one of the most abundant salmon in the region, important to tribes, fishermen and wildlife. Northern California’s Karuk tribe, which joined the Salmon River Restoration Council environmental group in petitioning for more protections for the fish, says the run is nearly extinct. Conservationists have pointed to Klamath River dams, which stop chinook from reaching historic spawning grounds, as a major factor in the decline of the spring run. The Federal Energy Regulatory Commission is expected to decide in 2019 whether to approve a deal among tribes, dam owner PacifiCorp utilities company, and others to remove the dams and reopen hundreds of miles of river to the migrating salmon. The federal fisheries’ move comes after a UC Davis study showed the spring chinook are more of an evolutionary rarity than realized when compared to runs that return to spawn later in the year.